IT WAS NOT a promising start. King James I of England had inherited a kingdom still reeling from centuries of religious strife. Anglicans, Puritans, and Catholics each sought dominance in church and government, and each had their own version of the Bible (respectively, the Bishops’, Geneva, and Douay-Rheims versions, as we shall see). Unity, always James’s ruling motive, seemed remote. He tried to foster it in the realm of religion by having 47 scholars work together to create one Bible version, to be read in all English churches. And miraculously, out of this committee of bickering intellectuals came one of the most popular and enduring works in the history of the English language. But no one at the time, or even decades later, would have guessed at this iconic status. From the beginning, the King James Version had plenty of enemies. The Translators clearly expected resistance to the new translation, and they got it. Dr. Hugh Broughton, the distinguished but widely disliked Hebrew scholar, fired the first salvo. His disgruntled missive to the king showed the famous irascibility that had kept him off the translators’ list in the first place. Said Broughton: “The late Bible . . . was sent to me to censure: which bred in me a sadness that will grieve me while I breathe, it is so ill done. Tell His Majesty that I had rather be rent to pieces with wild horses than any such translation by my consent should be urged upon poor churches. . . . The new edition crosseth me. I require it to be burnt.” We may suspect Broughton of more than sour grapes: for the past 30 years, he had been doing his own translation, based on the beloved Geneva Bible. The biggest competitor to the King James Version in the people’s affections was the Geneva Bible. In fact, soon after his own version was produced, James had to ban the printing of any new Geneva Bibles, so that people would take up the King James Bible. This did not check the flow. Printers got around the production ban by printing new Geneva Bibles with the earlier date on the title page, so it looked as though they were older copies. What made the Geneva Bible such a formidable competitor to the king’s new version? It all becomes clear when we know the Geneva Bible’s origins. Under the Roman Catholic Queen Mary, whose reign began in 1553, militant Protestants protected their ability to practice their religion unhindered—and potentially their lives—by fleeing to Geneva, Switzerland. There they set to work producing a new translation, named after the city that Calvin had helped to turn into a Protestant mecca. The translating team, scholars all, bore impeccable Puritan credentials. The four chief translators were William Whittingham, a former student at Christ Church, Oxford; Christopher Good- man, a Nonconformist; Thomas Sampson, a Calvinist later ordained by Bishop Ridley in the Anglican Orders; and Richard Cox, a Lutheran and headmaster of Eton. These men used the best scholarly resources available and made corrections of the English text from the original languages—resulting in a translation that improved considerably on earlier versions. First printed abroad in 1560, by 1576 Geneva Bibles were pouring from the presses of England. In Scotland, the fiery Reformer John Knox loved its Calvinist pedigree. In 1579, the year the Geneva Bible was first printed in that country, Scottish law required that every household with sufficient means buy a copy. By 1604, when the Puritans at Hampton Court successfully petitioned King James to create the KJV, the Geneva Bible had be- come the runaway favorite of English Protestants every- where, far outstripping such more official but less loved versions as the 1538 Great Bible and its revised succes- sor, the Bishops’ Bible of 1568. After 1611 the nation’s official Bible printers, Barker, Norton, and Bill, still printed the Geneva Bible in at least ten editions, along with four separate editions of the New Testament. After the king’s 1616 proscription of Geneva Bible printing in England, copies continued to flow in from Amsterdam and Dort well into the 1630s. Indeed, Barker went on to print both versions to the year 1617 and probably later. Finally in 1640 the anti-Puritan Archbishop Laud, seeking to limit distribution of this version with its divisive marginal notes, made importing it illegal. Laud used the excuse that bringing in Geneva Bibles from abroad created unfair competi- tion for the English printing trade. Whence the popularity that required actual legislation to uproot the Geneva Bible? For one thing, its language was clearer and more vigorous than the often dull Bishops’ Bible, the translation authorized by the Church of England under Elizabeth I. The Geneva was also smaller than earlier Bibles, and even available in pocket editions. More important for wide distribution, it was less expensive than the Bishops’ or Great Bibles. In the late 16th century it is likely that the Geneva New Testa- ment cost less than a week’s wages even for the lowest- paid laborers. The form of the notes was also important. They were created to serve a clarifying, teaching function. The Geneva translators had absorbed Calvin’s understanding that Bible reading and theology teaching must be “accommodated to the ability of the individual.” To err is human—or at least too typical of the simple human reading his or her Bible—and so to explain and illustrate was divine. The Geneva Bible aimed to remove as many difficulties as possible for the sake of the reader’s clear understanding. Simply put, in its readability as well as (for many) its theological slant, the Geneva Bible was “user friendly.” This was enough to ensure that under both Elizabeth and James it would remain the most widely read Bible in England. The King James did not finally begin to supplant the Geneva in its native land until the period of Restoration (1660s), and in Scotland the Geneva lasted even longer—as late as 1674 at least one Scottish parish was still using it in worship. In the realm of Bible translation (as the modern “King James Only” movement in America also attests) beloved old versions die hard. The Geneva Bible was not the King James Version’s only competitor. English Roman Catholics had their own favorite: the Douay-Rheims. 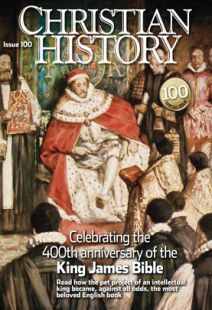 During Elizabeth’s reign, the English Roman Catholics no longer enjoyed the patronage of the Catholic Queen Mary and found themselves persecuted—even martyred—and forbidden to worship publicly. Some pursued the same route as the Puritans—working from exile to establish themselves with the hope of returning to an England more in line with their beliefs. In 1568, a group of these exiles founded a Roman Catholic English College called Douay (or Douai) in Flanders. Here, as the Roman Church sent missionaries back to England to restore the Catholic religion, a man named Gregory Martin began the first English translation for Roman Catholics. Starting with the Old Testament, Martin, a former Fellow of St. John’s College, Oxford, worked at a feverish pace. Each day he translated two full chapters and then passed them on to two other scholars for revision. In 1582, the first part of the project was printed at Rheims—the New Testament. The translation of the Old Testament, however, was slowed by a lack of funds, hindering its publication until nearly 30 years later. Both were welcomed with relief by English Catholics. No more would they be forced to read Protestant versions. Although it made use of much modern scholarship, the Douay-Rheims translation was made from the Latin Vulgate which, in the view of the editors, was “truer than the vulgar Greek text.” Also, the translation was literal, in opposition to the Protestants’ “presumptuous boldness and liberty in translating.” In places, then, it was unintelligible to those unfamiliar with Latin. Both text and notes were designed to show the Catholic tradition’s opposition to the interpretations of the Reformation. No less argumentative than the Geneva, the Douay-Rheims took plenty of potshots at Protestants. Later, however, the Douay-Rheims succumbed to the rising popularity of the King James Version. During the first half of the 18th century, the Authorized Version so flooded England that in 1752 the Roman Catholic Church in England issued a revision of the 1610 Douay-Rheims Bible by Richard Challoner that was very much closer to the Authorized Version than it was to the original. This became the standard text for Roman Catholics until the 20th century. In its early decades, the King James Version had to contend not only with people’s preference for rival versions, but also with more direct, even violent criticism from both the Protestant and the Catholic camp. From the beginning, the wide and unified support James had envisioned for his Bible seemed unlikely. In fact, the stakes here were much larger than decisions over versions. The divisions expressed in this “Bible war” led to physical conflict: the Puritan-led Civil War of the 1640s and 50s. Religious and political minefields were not the only hazards on the landscape of the KJV’s early history. The text itself was also pockmarked with potholes—some- times quite deep—left by poor editing. Misprints in- cluded hoopes for hookes, she for he, the repetition of three whole lines in Exodus, and even, in one of the Gospels, Judas for Jesus! The 1631 edition unwittingly revised the Ten Commandments themselves, insisting, “Thou shalt commit adultery”—for which the printers were fined £300 (over £33,000 in today’s money) and deprived of their license. Printers’ errors only added fuel to the flames of textual criticism. Christopher and Robert Barker secured an extensive patent from Queen Elizabeth to print the Scriptures, embracing “all Bibles and Testaments whatsoever, in the English language, of whatever translation, with notes, or without notes, printed before then, or afterwards to be printed by our command.” The Barkers printed at least two separate issues of the KJV bearing the 1611 date. The first one was completed and rushed out the door in a single effort. The second and subsequent editions, however, were printed piecemeal, during “down-time” from other work. This more haphazard process led the printer to sometimes mix pages of corrected and uncorrected editions when binding them. Such was the muddle in Barker’s print shop that in the end, no two copies of the Bible contained exactly the same set of sheets. Another problem with early editions was readability. The first printing of the Authorized Version was as a folio, available loose-leaf for 10 shillings, or bound for 12. These versions were large, designed for use on lecterns. In later printings smaller sizes were available. The pages had, in Nicolson’s words, “a heavy antique feel,” with a dense, Gothic-style black-letter typeface creating “a certain airlessness on the page.” In contrast, Geneva Bibles and other popular English Bibles from French and Swiss presses had been printed for decades using open, more legible Roman typefaces. On top of that, the new Bible was punctuated heavily in an effort to help those who read the Bible aloud in church to do so with the proper pronunciation and emphasis. Paragraph marks (¶) appeared up to Acts 20:36, but not after that. This added to the complexity of each page. Later editions were available in smaller sizes and with a Roman face. Surely its inaccuracies and readability issues help account for the fact that, early on, very few copies were bound and sent to churches. Critics also raised their voices against the Translators’ choice of source texts: “The Translators appear to have . . . made no first-hand study of ancient manuscript sources, even those which—like the Codex Bezae—would have been readily available to them,” wrote historian Benson Bobrick. The Authorized Version of the New Testament did owe something to the Vulgate. “The best revenge,” said Frank Sinatra, “is massive success.” In the end, this was what the King James Bible achieved. It weathered all storms and outstripped all competitors, to find an unparalleled place in our language and culture. In the short term, after the restoration of the monarchy in 1660, when the English people wanted to mend the huge rupture in their country, they began to take up the King James Bible as what Nicolson calls “a template of wholeness—a sort of, by then, rather antique dream of what England might be.” The version that was a disaster at its first printing became the symbol of optimistic hope in the later 17th century. In a breakdown of queries regarding Bible translations, Google reported in the early 21st century that the KJV was the translation most consulted, with the NIV coming next. And one of the most intriguing examples of the resilience of and resistance to the KJV in its long history happened in 2010 in the form of an 80-million-dollar action thriller movie released by Warner Brothers. The Book of Eli is set in a post-apocalyptic world, 30 years after a nuclear holocaust has devastated the planet. Small pockets of survivors struggle in a lawless and squalid wasteland; the future of humanity lies in the recovery of a book that has been lost. The hero, played by Denzel Washington, launches out on a mission to get that book to a small surviving community on Alcatraz Island, where artifacts of cultural heritage are being recovered and restored. The single treasure that must be saved for the future hope of civilization turns out to be the King James Bible. But the evil tyrant Carnegie opposes the recovery of the KJV and will go to any length to confiscate it, as he sees it as an instrument of social control.